Mitsubishi Chemical Advanced Materials has been a solution provider for the energy generation industry for many years. Our expertise is built on application successes in traditional energy sectors like oil & gas, but more and more in emerging alternative energy fields such as wind and solar. Mitsubishi Chemical Advanced Materials's global presence, our broad range of materials and variety of conversion technologies offers turn-key solutions for your specific industry, already proven or customized. Our materials are extensively tested and able to operate under harsh chemical and even extreme thermal conditions. Our high performance materials offer the advantages of all plastics, helping to reduce weight and allow for the substitution of other materials like steel, aluminum or ceramics, due to their high specific strength. Our materials have been tested and certified for applications in vacuum chambers offering very low out gassing. We also offer materials for wet process environments presenting low out leach values. 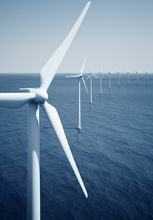 The manager of a wind farm contacted Mitsubishi Chemical Advanced Materials, asking for our help to eliminate a performance and maintenance problem. The bearing surfaces in the positioning system of each unit were rapidly failing because of weather, temperature and mechanical load, which was also causing the units to make very loud noises. These failures would require a maintenance worker to climb a 260ft ladder and apply lubricant into the unit’s stuck bearings whenever the problem occurred, at night, on freezing cold winter days or the peak of summer. Capacity loss of broken units and emergency maintenance were a major expense. A grade of Mitsubishi Chemical Advanced Materials’s Ketron® PEEK HPV was identified as a solution for the bearing problem. It offered the ideal combination of lubricity, load bearing capability, low coefficient of friction and eliminated noise. Depending on the individual situation, Ertalyte® TX or Nylatron® 703 XL would typically provide these required material qualities as well.